Kennedy Center tickets are available as of April 28th for purchase for “Sound Health: Music and the Mind” at the Kennedy Center, June 2nd and June 3rd. Join AMTA at this major national event, honoring the power of music and music therapy, made possible by a partnership between the Kennedy Center, Renée Fleming who is artistic advisor for the Kennedy Center, and the National Institutes of Health. A Friday night concert (June 2nd) with the National Symphony Orchestra, led by conductor Edwin Outwater, alongside renowned neuroscientists Dr. Daniel Levitin and Dr. Charles Limb, kicks off the weekend. Saturday, June 3rd, will feature a full day of sessions with interactive presentations and shows focusing on music therapy (Dr. Sheri Robb - 1:30-3:00 pm), music and child development (Dr. Nina Kraus - 11:00-12:30 pm), creative aging (Dr. Ani Patel - 5:00-6:30 pm), and jazz, creativity and the brain (Dr. Charles Limb - 7:30-9:00 pm). These $20 ticketed events in the Family Theater are open to the general public. Watch the video about this important partnership and event. 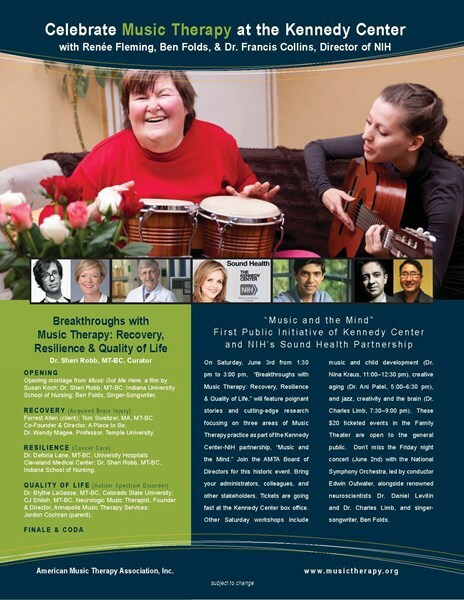 On Saturday, June 3rd from 1:30 PM to 3:00 PM, “Breakthroughs with Music Therapy: Recovery, Resilience & Quality of Life,” will feature poignant stories and cutting-edge research focusing on three areas of Music Therapy practice as part of the Kennedy Center-NIH partnership, “Music and the Mind.” Join the AMTA Board of Directors for this historic event. Bring your administrators, colleagues, and other stakeholders. Tickets are going fast at the Kennedy Center box office. Other Saturday workshops include music and child development (Dr. Nina Kraus - 11:00-12:30 pm), creative aging (Dr. Ani Patel - 5:00-6:30 pm), and jazz, creativity and the brain (Dr. Charles Limb - 7:30-9:00 pm). These $20 ticketed events in the Family Theater are open to the general public. Don’t miss the Friday night concert (June 2nd) with the National Symphony Orchestra, led by conductor Edwin Outwater, alongside renowned neuroscientists Dr. Daniel Levitin and Dr. Charles Limb, and singer-songwriter, Ben Folds. THIS EVENT WILL LIKELY SELL OUT FAST SO DON’T DELAY YOUR TICKET PURCHASE! AMTA encourages you to purchase your tickets as soon as possible to the concert and the sessions on June 3rd. Feel free to download, print and share this flier from the Kennedy Center as well as this music therapy specific flier, with family, friends, administrators, and other interested colleagues.